Running contrary to the current mania for folding “tactical” clip knives, I went shopping for a big, strong sheath knife for those extended backwoods survival treks and hunting trips. I looked at a bunch of knives and there are a bunch of knives out there. 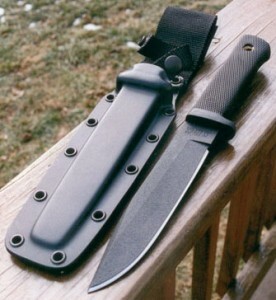 After looking at a bazillion or two, I settled on the Cold Steel SRK (Survival Rescue Knife). It seemed to have the right balance of size, style, price, and quality for the mission I had in mind – hunting and backwoods survival. I saw larger and more stylish knives, some ridiculously large and/or expensive, but the SRK hit the best convergence of features I sought at a price I felt OK about paying. As a long-time knife enthusiast, it is delightful to me to see the proliferation of quality knife makers producing so many excellent offerings. The choice used to be Case, Buck, or Schrade with the occasional appearance of a Ka-Bar, Boker, or Camillus. With the exception of Ka-Bar and the pilot’s knife from Camillus, most of the edged offerings from the major makers were hunters or utility pieces. The “new generation” of knife makers, led by Cold Steel, Benchmade and Gerber, seem to have stumbled onto a whole grab bag of fresh ideas. Some of these ideas are no doubt inspired by the advent of new technologies in polymer plastics and metallurgy itself. Some of the influence seems to be the near-mystical tradition of Japanese edged weapons and the metallurgy which produced them. And finally, a highly significant influence is the concept of the “tactical knife” – in other words, a knife designed with the realization that it may need to serve as a weapon. Back to the blade: It’s six inches long and is 3/16″ thick with a clip point. It’s very substantial. Cold Steel hand sharpens their knives to a near-razor edge, so if you buy one, be careful with it or you can cut yourself before you know it. The steel of the SRK is “Carbon V” which Cold Steel describes as an alloyed carbon steel. When I started collecting knives, stainless steel in knives was a novelty – the Victorinox Swiss Officer’s Knife. The rest were made of carbon steel. Then came Buck with their stainless blades and the famous “hammer the blade through a ten penny nail” advertising campaign. From that point on, most knife makers moved to various formulations of stainless steel for their blades, mostly because it is easier to maintain. I have always felt that carbon steel took and kept a razor edge better than stainless. The downside is that carbon steel tends to be more brittle and therefore breaks easier. Those are my opinions and I’m sure that others have different perceptions, but my preference for getting a really keen edge on a knife is carbon steel. (I prefer carbon steel in 1911-pattern pistols too.) Hence, the Carbon V steel of the SRK appealed to me. So did I drive it through an oil drum or stab it into a piece of oak to try to break it off? No. Did I take it on my latest black op mission? No, I’m not a SEAL. Did I fight a horde of blood-thirsty gang-bangers with it? No, didn’t do that either. It’s a really solid knife and not my first Cold Steel blade and I have every confidence that it will fulfill whatever expectations I place upon it. Survival/Rescue operations demand a versatile knife able to withstand extreme abuse. The SRK® was designed by Lynn Thompson with this in mind. No expense was spared in steel, heat treating and construction. Only expensive surface polishes have been eliminated. Instead, the blade has a rich black epoxy powder coat to help protect the Carbon V® steel from the elements. The blade features a tremendously strong clip point that’s fine enough for delicate work, yet possesses enough belly for efficient cutting, slashing and skinning strokes. An exclusive carbon alloy steel, formulated and extensively treated to achieve exceptional properties. Carbon V® was developed and refined by using both metallurgical and performance testing. Blades were subjected to the “Cold Steel® Challenge” as a practical test, and then they were sectioned, so that their microstructure could be examined. In this way we arrived at the optimum steel AND the optimum heat treatment sequence to bring out the best in the steel. We buy large quantities of premium high carbon cutlery steel with small amounts of elemental alloys added in the smelting stage. These elements enhance the blade’s performance in edge holding and elasticity. The steel is then rolled to our exact specifications to establish optimum grain refinement and blades are blanked to take full advantage of the grain direction in the steel. The blanks are heated in molten salt, quenched in premium oil and tempered in controlled ovens. Then they are ground. The new blades are then subjected to expert heat treatment, involving rigidly controlled austenizing temperatures, precisely defined soak times, proper selection of quenching medium and carefully monitored tempering times and temperatures. This heat treatment sequence results in blades which duplicate and often exceed the properties of the most expensive custom forgings.